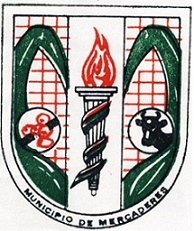 The municipality of Mercaderes is in Cauca Department. It was founded on 24 December 1535. The flag of Mercaderes is horizontally divided yellow-white-green. "Yellow represents richness; the main economical activity of the municipality, corn, is the source of the nickname "Corn Capital of Colombia". White symbolizes peace and harmony of the villagers. Green represents the mountains, "mecestas" and the green valleys of Mercaderes Cauca."